The small young French label Inferno Records has stumbled upon a true gem. 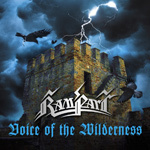 Rampart is young heavy metal band from Bulgaria playing in the classic tradition on Voice in the Wilderness, their first full-length release. This strong resurrection, also known now as the New Wave of Traditional Heavy Metal (NWOTHM), seems to have gone viral (to coin a Web 2.0 phrase), and is spreading around the world. There's at least one good thing to look forward to in this new year. A three man crew with extended help when they play live, Rampart wears their influences on their sleeves and in their songs: most anything from Accept or Iron Maiden to Helloween or GammaRay (to which they contributed to a tribute album on Epicus Records). A single spin of Voice in The Wilderness proves that Rampart has mastered the best elements of this grand heavy metal tradition. The arrangements blend copious amounts of melodic riffs, solos, and vocals over an aggressive and well-paced rhythm section. By example Warriors, The Flood, Desert of Time, and the heavy metal ode, Age of Steel show Rampart delivering the music that they love with enthusiasm and accuracy. Vocalists Maria Doychinova appears to have very strong skills, yet sounds reserved throughout, something that will surely improve on future efforts. She's most impressive on Age of Steel. Guitarist Yavor Kamenov can crack open some brisk solos as the aforementioned Desert of Time and Warriors prove. Overall, the combination of sound song composition, firm musicianship, and obvious enthusiasm make Voice in The Wilderness a strong debut, and Rampart a solid band to carry the mantle of classic heavy metal. Very recommended! The combination of sound song composition, firm musicianship, and obvious enthusiasm make Voice in The Wilderness a strong debut, and Rampart a solid band to carry the mantle of classic heavy metal.